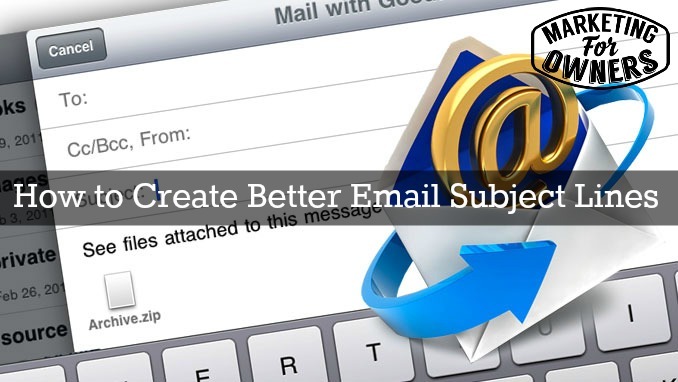 Today, we are talking about email subject lines. Now, it may sound boring, and you may thinking, “What do I have to know?”. People need to open your emails. People are going to open your email quotes and replies, and maybe they will open all your plain emails of trying to get a lead, appointment, or an introduction — if you are lucky they will open it. But email subject lines are like the headlines on the front of the newspaper or the magazine. That big thing in the middle with the big headline, that’s what sells the magazine. It can have fantastic stuff inside but if people don’t like the headline, they’ll never find out all of the juicy goodies that are hidden within, and that’s how it is with your email. People have lots of emails, far too many, and the people who are in a hurry are the ones who haven’t really organized it. They haven’t filtered out all the spam and so when they go down, they just quickly scan through and they think, “Who do I want to read stuff from?”. And it generally isn’t from a business, it’s from stuff that’s easy. So there are going to be times when you need to appreciate email subject line writing, but it’s not that hard because everyone else has figured it out before us. You can just copy what they have done and that’s what I suggest. So, it’s a kind of a thing you can learn. So, for example, go to Google, and then in your search bar, type in “best subject lines” and see what results comes up. Articles and lists would pop up and you might even see subject lines like, “The Seven Best Subject Lines Ever in a Headline”. Read them and see how they are worded. Generally,these articles will explain why they are good, so just make a note and just get a feel. This is not going to school or a college. You don’t have to learn anything. So don’t worry about all that kind of stuff. It’s nothing technical. Even better is, “Best Subject Lines for Code Emails” because that’s what quite often you are sending. It may be to get an appointment or an introduction or something like that or just trying to get in with somebody, to find out there details. You might think, “Who can I contact?”, and all that sort of stuff, but this is what I picked up quickly from an article and this got an open rate of above 35%. Now that is pretty good. Most people are going to get open rates around 10-12%, but if they follow this tip, these will get higher. Now of course this refers to code emails, generally for the kind of thing when you are trying to get an introduction or appointment or attention or something like that. You cannot use these over and over. Of course you can do it for a few months but not over and over, because that would appear to be spamming. That won’t help you at all. If it’s coming to me, do you think I am going to read that? This email tells me that the person knows exactly who I am. And I don’t know them. I want to know what they know about me. Who are they? I am going to open it. That’s it, you are listening, aren’t you? I have used this by the way, before I’ve read this, and it works. If you have had an email sequence from me at some point you will have gotten that. These things are fabulous. Imagine that arrives in your email among everything else, trying to connect, when you scan down. You will stop there. You will think about opening it. You are likely to open it. If someone sent something to me and it just says, “Marketing for Owners”, I am going to stare at that and think what’s that about and eventually, my curiosity is going to get the better of me and I am going to open it. Once inside, the email, you will read it, so it’s just to get the email open. There are many reasons why you need it. Direct mail is what they send you in the post and email or that kind of stuff. These people are experts, they have tested stuff to death and when people are going to research and find the best ones, they’ll find the most successful. These will be the ones which have been tested and they worked. So if you incorporate the style of their email into yours, they will work. I guarantee it. If you want to follow people who are brilliant at it, just search for something like Jeff Goins headlines, or Quicksprout headlines, or Copy Blogger headlines or Jon Morrow headlines. Jon Morrow is fantastic at them and they will give you more and more information that you could ever want to know about improving your headlines in emails. It’s what it is all about. Today it’s Tuesday. It’s time for a Toolbox tip and today I am going to share what we use for our CRM. Let’s talk about Insightly. We have been using Insightly since our company was very young. One of the plans that we run on was free when we started, but now we pay for it. Insightly integrates very easily with Google and everything. Once you have integrated it, Insightly becomes a perfect CRM tool. CRM stands for Customer Relationship Manager, so in other words, once you phone someone today or you talk to them on the phone. Then you find out what days are good for them and for appointments, what they like, what they don’t like. In a conversation you find out that they are just going to get a new puppy for their daughter. In your Insightly CRM, you note all this in their file. The, the next time you call them in a couple of months, you say, “Oh did you get that puppy? How did it go? What did your daughter think?” and imagine the difference that makes when you are calling that person. So that’s how the experts do it. You can make sales sometimes by doing this. Insightly is brilliant and it’s for people like us, even I can use it. Go try it, I guarantee that it’s good. What do your email subject lines look like?